By the last days of our 14-day tour we were almost at the point of leopard overload. In fact, after I post this, I plan on getting back to processing leopard images, I can't remember ever being this far behind on images, ever. My leopard tour is unusual in that; it is set up to get as much photography of leopards, other big cats and the big 5 as possible. This means we don't spend time experiencing the culture of local villages, as this would take time away from our safari drives, we do not waste time driving to and from different lodges, we just concentrate on going on safari drives at least twice a day, sometimes more. This has a big impact on your photography time in the field, most 11-day safaris offer maybe 12-13 drives, during our 11-day tour we normally manage to go on 18 drives in 11 days, those 5 extra safari drives can make a huge difference on leaving Africa with the images you really want on your hard-drive. NIKON D850 and Sigma 120-300 f/2.8 sports lens at 120mm, 1/1250th sec, f/3.5, ISO 2500 manual mode, Auto-ISO, EV 0, handheld. We were able to spend a couple of hours one morning with this male, who has just taken over the territory and females, of a very old male leopard. Leopards like to walk along river banks in the morning, surveying their territory, and marking their property every chance they have. NIKON D850 and Sigma 500mm f/4 sports lens at 1/800th sec, f/4, ISO 1600 manual mode, Auto-ISO, EV 0, handheld. This leopard is taking a much deserved rest from taking care of her two cubs, we spent a lot of time with her and the young ones over our 14 days of the tour. This female's two cubs will be the main subject of the next tour report. NIKON D500 and Sigma 500mm f/4 sports lens at 1/500th sec, f/4, ISO 450 manual mode, Auto-ISO, EV +0.3, handheld. 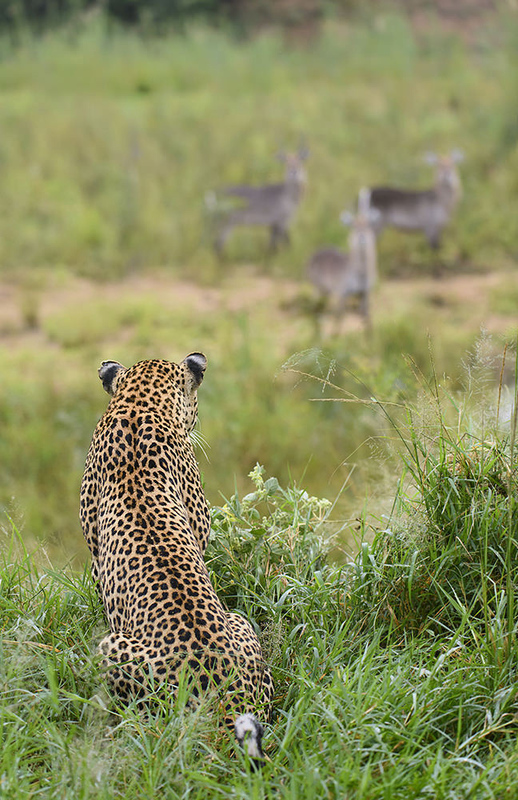 This leopard is really interested in something she heard, and is scanning the horizon, she might have heard something that sounded like one of her cubs. NIKON D500 and Sigma 120-300 f/2.8 sports lens at 120mm, 1/1600th sec, f/4, ISO 320 manual mode, Auto-ISO, EV -0.3, handheld. After an exhausting week this male and is taking a quick 5 minute breather before getting back to work. We watched this leopard mate with two different females more than a few times over a week. They normally stay with a female for 3 or so days, mating every 15-20 minutes. This male would alternate over 7 days, one day with one female and back with another a day or two later. NIKON D850 and Sigma 500mm f/4 sports lens at 1/500th sec, f/4, ISO 640 manual mode, Auto-ISO, EV +0, handheld. Tomorrow's post will feature leopard cubs, one my very favorite subjects of all time, so check back in a day or two for part 3 of the report. We're back in the office now from this year's tour in South Africa and I have to say that our experiences will be etched into my memory forever. During last year's tour we had a once-in-a-lifetime close-up encounter with a lioness, this year the opportunities were even more unbelievable, it's hard to even decide where to start. 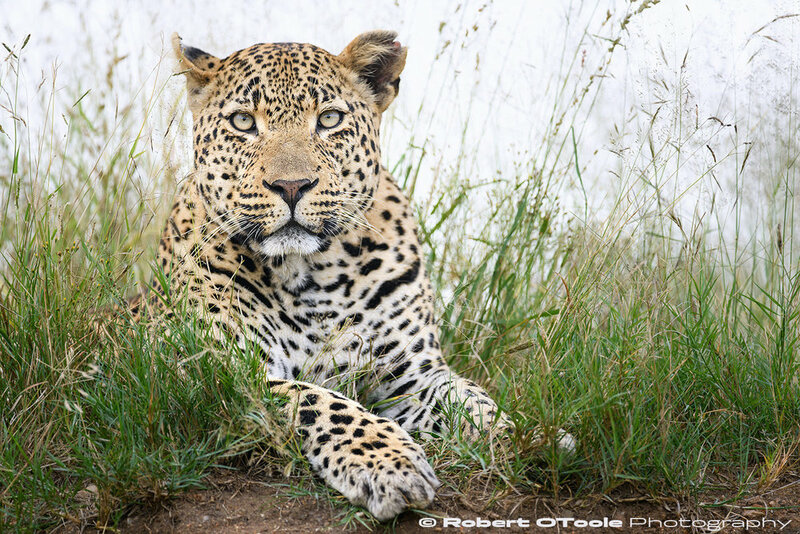 Over the 14 days of the tour we photographed at least 12 different leopards, this is just one of our experiences. This year my group and I experienced an encounter that just doesn't happen to people on safari, not even to professionals that spend years in the field. Our tracker George caught a glimpse of a leopard carrying something in its jaws, right before it disappeared into the bush. Our ranger named Omega explained to us that we most likely saw a mother leopard carrying one of her young to a new den, and it gets better, the mother most likely has 2 cubs, so he told us that if we wait in the same position, we will most likely get to see her carry another on the same path since she will probably use the exact same route again, which is the shortest safest route between the old and new dens. So we waited in a dry riverbed for 20 to 30 minutes and eventually George spotted something at the top of the bank and then it happened. We could see the mother carrying her second cub walking directly at us, and then she turned and walked along the edge of the river bed for about 10 minutes, and then up the other side before disappearing again. George and Omega told us that in all of their years guiding, thats 50-60 years of combined experience, they had seen this once before, and we were there to see, and photograph it. NIKON D500 and Sigma 500mm f/4 sports lens at 1/1600th sec, f/5, ISO 400 manual mode, Auto-ISO, EV - 1.0, handheld. We watched the mother leopard calmly carry the three week old cub past us, while it struggled and kicked as it went by only 10 - 15 feet away, I was really grateful to be able to experience this moment, but at the same time, as a photographer, it was one of the most frustrating moments of all time. The late morning sun was out in full strength and the sky was cloudless, so the light was impossibly harsh, and to make the situation more hopeless, we were on the wrong side of the leopard! Even though the lighting conditions were terrible, I was able to take a dozens of images as the female leopard walked at us and along the river bed, and I was able to make one that I like, backlit, tight and very close-up as she passed directly under the sun. This post is the first in a series, so there will be many more images and stories uploaded this week. 25 mph winds with 50+ gusts and the 9-foot swell couldn't keep us from having an amazing and very successful third and final photo tour. Even in the worst weather possible, the opportunities were really outstanding, far and beyond the opportunities, almost anywhere else on the planet in perfect conditions. It's that good. Not convinced? 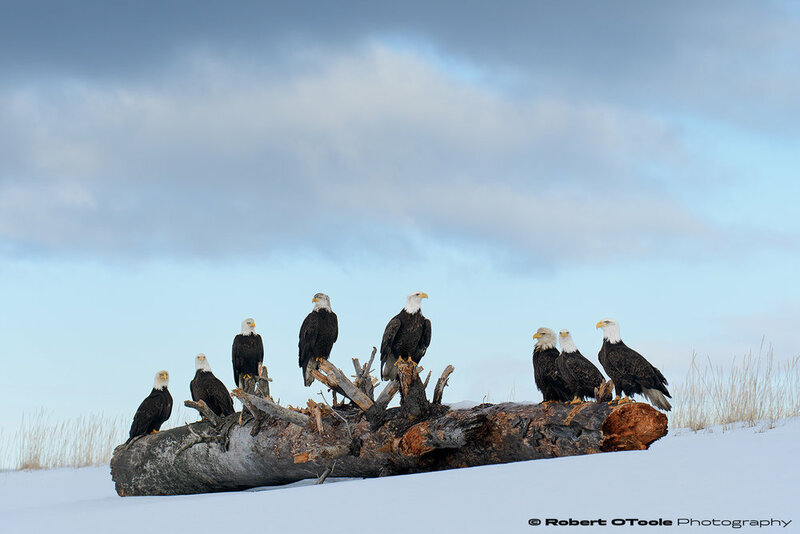 Where else on the planet can you photograph dozens of eagles at every shoot, in perfect light, in 100% natural surroundings, all while shooting with at less than 300mm focal length? 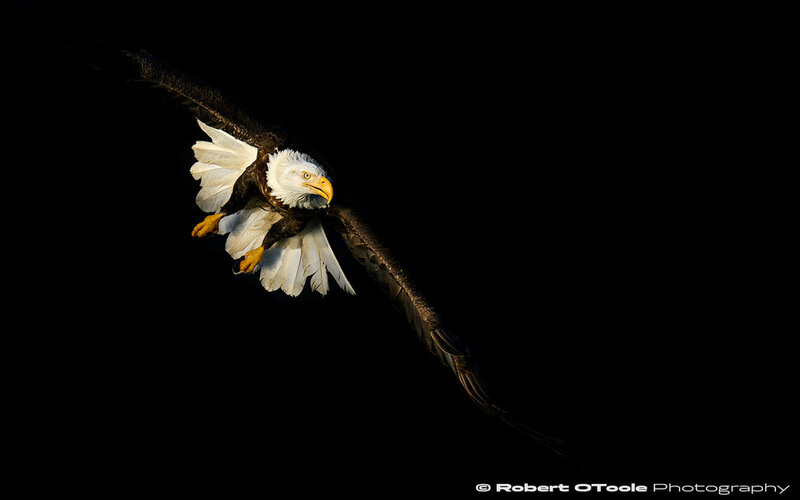 Bald eagle against a deep black cliff-side shadow. Nikon D850 with Sigma 150-600 Sports lens at 230mm 1/2500th sec at f/8 ISO 400 handheld and manual mode. The rock wall that blocked the howling NE wind, also cast a deep black shadow that created the special lighting effect. The photo is 100% natural but people assume that it was Photoshop creation, not a real image. Bald eagle top bank made with the camera held vertically (shoot in vertical orientation with the battery grip). Nikon D850 with Sigma 120-300 Sports lens at 250mm 1/4000th sec at f/5.6 ISO 400 handheld and manual mode. 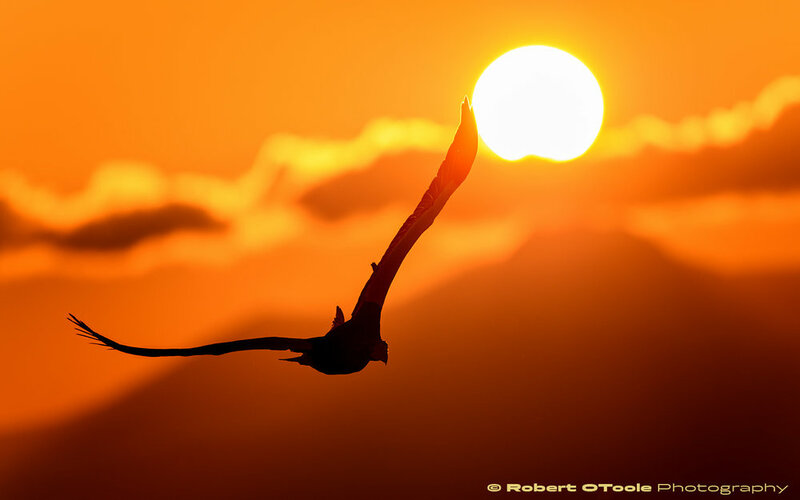 By the last couple of days of the tour, our participants were happy, and more than satisfied from all the shooting, most had around 18,000 to 20,000 images, shot over 5 days of the tour. The shooting was really spectacular with some really memorable moments. My image count, for comparison, was a little less than 20,000 images for all three tours! 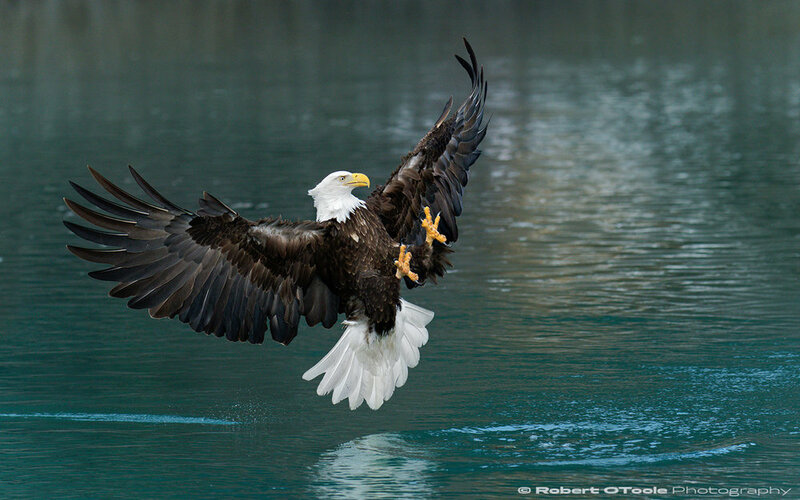 Bald eagle inverted bank. Nikon D850 with Sigma 150-600 Sports lens at 270mm 1/4000th sec at f/8 ISO 400 handheld and manual mode. This inverted bank image was made with the camera pointed slightly upwards, when the eagle flipped upside down after a vertical climb, and right before they dive straight back down. Bald eagle juvenile top bank with its head turned back. Nikon D850 with Sigma 150-600 Sports lens at 270mm 1/3200th sec at f/8 ISO 400 handheld and manual mode. 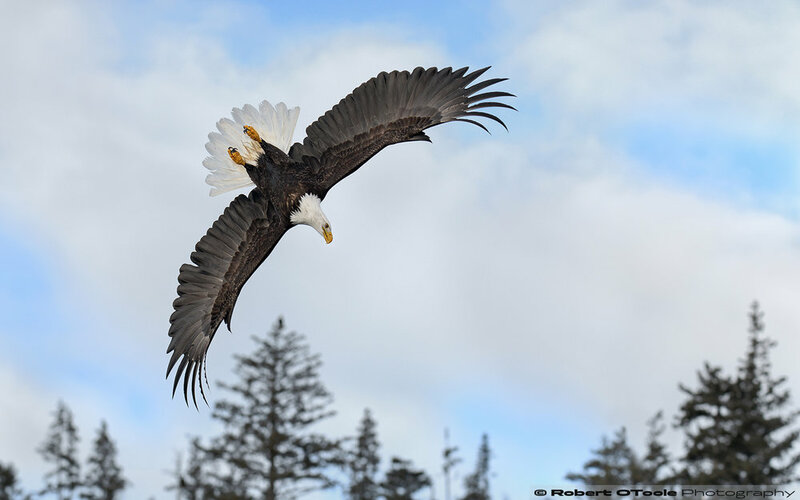 To guarantee the best results on our eagle tour is to join us for both tours. This way you can relax and have plenty of time to learn the birds flight patterns and even get to know some of the individual birds. About 80% of my business is returning photographers or referrals. Some people have taken our eagle tour 4 or 5 times! Eagle peak. Nikon D850 with Sigma 150-600 Sports lens at 600mm 1/800th sec at f/8 ISO 400 handheld and manual mode. Some photographers on the tour remarked that on the 3rd day of the 5-day tour they were already done. They had more images than they thought possible, at a level that surpassed their expectations. 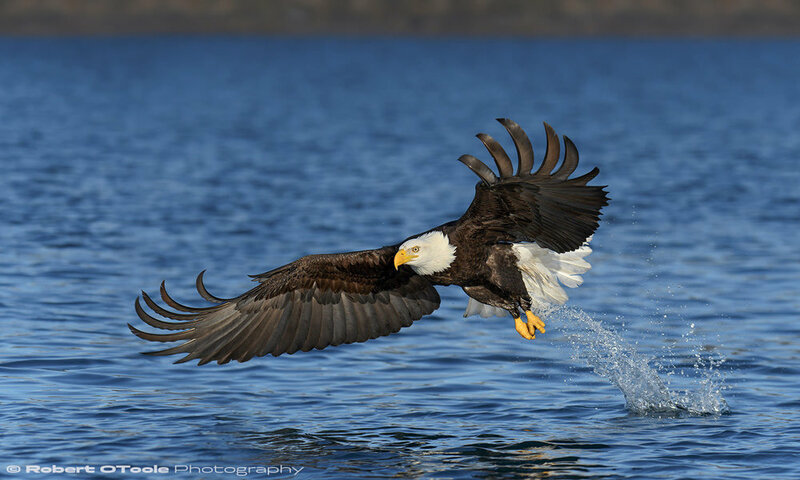 Being able to offer this tour that lets people experience something really unique and unforgettable in eagle photography, is really rewarding. Thinking about joining us in 2019? Let me know as soon as you can, the tour dates are already selling out as I write this. Drop me an email if you have any questions, or if you would like to join us next year. $500 Early registration discount until August 2018. 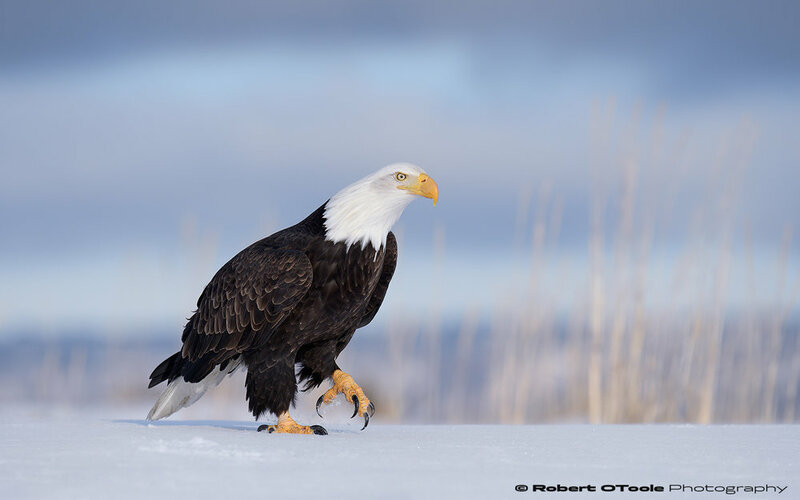 We're back from Japan now and getting ready for eagles in Alaska next week. Our trip this year was a great success, most of all, thanks to our group, and a big thank you to them for making it all possible. Snow is the most important factor in Japan and we had one day of falling snow for monkey photography and a big snow storm for the cranes. As always, we started the tour at the snow monkey park, and even though, the snow level this year was way below normal, our visit was timed perfectly for one amazing day with falling snow. The snow monkeys, like all the other subjects we photograph in Japan, are completely habituated and comfortable around people. There were tons of opportunities for monkey grooming, playing, cuddling, and of course lots of stream jumping to keep everyone busy burning through cards. Our next stop was Rausu on the Northern coast of Hokkaido, where the pack ice showed up very early this year, but south winds kept the ice away from shore and near the Kuril islands. In fact, we were so close to the Russian Kunashir island, that T-Mobile sent me text message welcoming me to Russia. After an eagle shoot each morning we would spend the rest of the day scouting for the fox, and this year we were spotted more than 10 a day. The Hokkaido fox are are out during the day in the mating season, and they are so habituated, they will often come close to investigate photographers, and seem to enjoy hanging around us to be photographed. 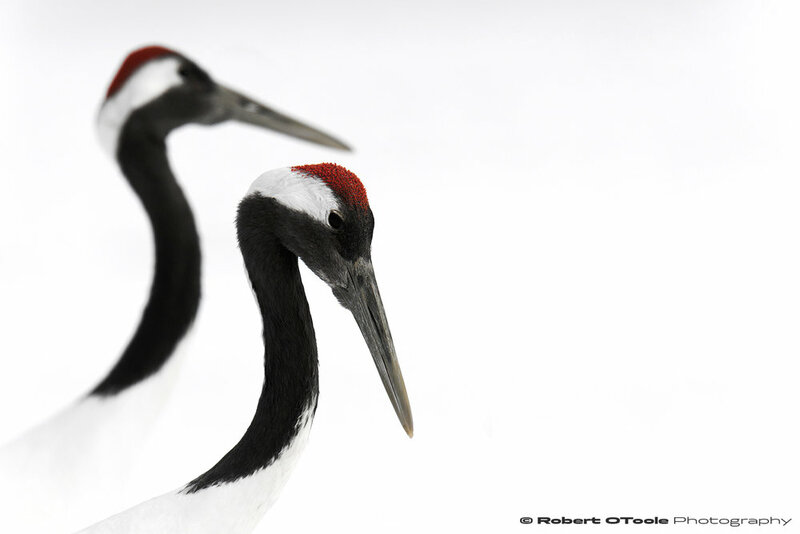 The last days of our tour were spent photographing the Japanese red-crowned cranes. The flight action this year was just awesome, some in our group managed to shoot hundreds of gigs in a single morning, thats Gigabytes not Megabytes. This year we had a surprise visitor join our group from Asia, a Eurasian crane, this medium sized dark gray crane is a very rare to Hokkaido. This individual had very fresh feathers. There are more and more tour operators starting to offer tours to Japan but none offer what our tour offers; exclusive ultra small group size, the most shoot per tour, 20 shoots over 14 days, 10 years of experience leading tours in Japan, single accommodations without an extra fee, and an exclusive high-end lens factory tour! This year our tour group visited high-end lens manufacturer Cosina's headquarters and factory near Nagano. If you are not familiar with Cosina, they build Zeiss lenses (since 2006) and the famous Voigtländer lenses to name just two of the brands they manufacture. 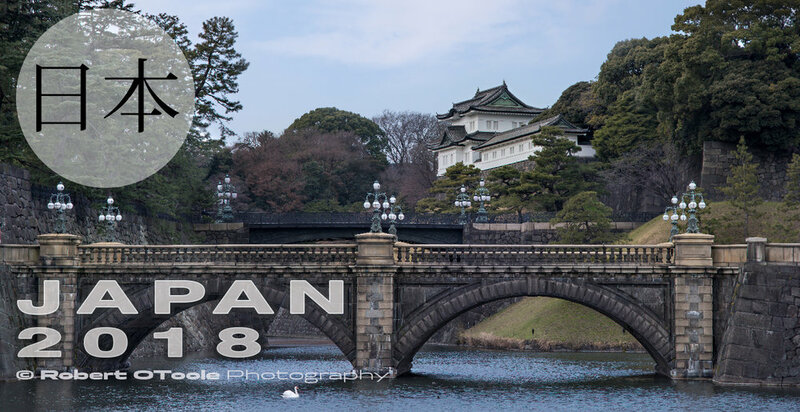 Hope you can join us in Japan in 2019!